Spearmint-infused Keep It Simple Syrup is made with a custom blend of this refreshing, aromatic herb: a standard fixture in the Southern classic, the Mint Julep, and the Cuban icon, the Mojito. Its bright, clean flavor adds a hint of warm, summer days to any libation or beverage. While nothing can replace a sprig of fresh mint as a sophisticated garnish, Spearmint-infused KISS does the muddling for you. Buy three bottles and save 15%! 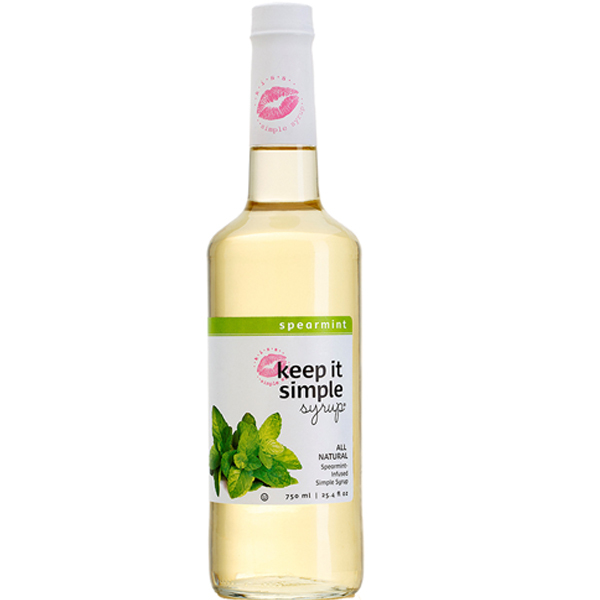 Spearmint-infused Keep It Simple Syrup, in our economical 750ml sized bottle, is made with a custom blend of this refreshing, aromatic herb: a standard fixture in the Southern classic, the Mint Julep, and the Cuban icon, the Mojito. Its bright, clean flavor adds a hint of warm, summer days to any libation or beverage. While nothing can replace a sprig of fresh mint as a sophisticated garnish, Spearmint-infused KISS does the muddling for you. Achieve the delightful, unique characteristics of mint, naturally, without the effort. Enjoy it year-round in iced tea, sparkling water, fresh fruit, desserts, and savory dishes.